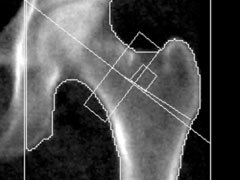 Also called dual-energy X-ray absorptiometry (DXA), bone densitometry is an enhanced form of X-ray technology used to measure bone mineral density (BMD). The DXA machine uses a thin, invisible beam of low-dose X-rays with two distinct energy peaks. One peak is absorbed mainly by soft tissue and the other by bone. The soft tissue amount is subtracted from the total and what remains is a patient's BMD. A bone densitometry test can also assess your risk for developing fractures. If your bone density is found to be low, you and your physician can work together on a treatment plan to help prevent fractures before they occur. This test can also track the effects of treatment for osteoporosis and other conditions that cause bone loss. What you can expect during the DXA? Bone densitometry is a simple, non-invasive procedure performed on an outpatient basis. The study is usually completed in 10 to 30 minutes, depending on the body parts examined. Typically, the lower back and hips are measured. The patient lies on a padded examination table and remain still for a short time while the arm of the machine passes over their body taking measurements. It is important that you stay as still as possible during the procedure to ensure a clear and useful image. The procedure is painless and radiation exposure is minimal. You may eat normally on the day of the exam, but do not take calcium supplements for at least 24 hours beforehand. Wear loose, comfortable clothing, avoiding garments that have zippers, belts, or buttons made of metal. Inform your physician if you have recently had a barium examination or have been injected with a contrast material for a computed tomography (CT) scan or radioisotope scan; you may have to wait 10 to 14 days before undergoing a DXA test.